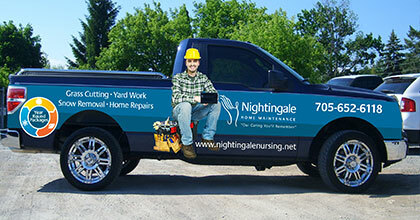 Nightingale HOME MAINTENANCE INC is proud to have Nightingale Nursing Registry Ltd as its parent company. Since 1985, they have served the home health care needs of Peterborough City & County and the surrounding areas, 24 hours a day, 7 days week. Since 2004, the team at Nightingale Nursing Registry Ltd has been continuously given the Accreditation Canada Award for outstanding health care and the delivery of quality service. Whether you require care in your home, hospital, or institution, Nightingale is always just a call away. With a caring staff of registered nurses and RPN’s, patients truly value the care they receive. We invite you visit the Nightingale Nursing Registry website to arrange an appointment, or download their brochure for additional information. For all your home maintenance, modification and renovation needs, call Nightingale Home Maintenance!